Understanding cellular diversity and dynamics in tumor microenvironments are critical for elucidating mechanisms of cancer progression, response to therapeutics, and patient prognosis. Until recently, tumor analysis had primarily been accomplished by either analyzing protein cell-surface markers via flow cytometry (a process that is more straightforward for liquid tumors than for solid tumors), or by bulk RNA expression analysis of a heterogeneous population of tumor cells. Neither solution provides a complete understanding of the mechanism of disease progression. These products create a standardized method for generating integrated protein and gene expression data at the single-cell level. Together, they provide a greater understanding of the tumor microenvironment and heterogeneity within cell populations. The BD single-cell gene-expression platform is a complete system of reagents, instruments, and analysis software that works together to provide digital, quantitative gene-expression profiling of thousands of single cells via next-generation sequencing (NGS). The methodology enables the identification and profiling of rare cell types within a highly heterogeneous population. Components include a novel planar array of 200,000 microwells for cell capture (single-cell cartridge), bead-based 3’ RNA-seq assays, sample-loading station, cartridge scanner for QC analysis, and a suite of data analysis and visualization tools. BD’s patented molecular-indexing technology provides the foundation for the BD single-cell gene-expression assay.2 This technology captures mRNA molecules and immediately tags them with a cell-specific identifier (cell barcode), plus a unique molecular index (UMI) for each individual mRNA. This methodology allows for the pooling of tens of thousands of cells into one tube for a simplified workflow for targeted, single-cell gene-expression studies. The workflow begins with dissociating a tumor or tissue sample with BD TuDoR. This reagent has been optimized to minimize cell death, delivering high yield such that the tumor heterogeneity is maintained. The resulting cell suspension can either be loaded directly into a BD single-cell cartridge, or can first be enriched by FACS for specific cell types (for example, tumor or T cells). The cell suspension is made such that 1 out of every 10 wells of the cartridge contains a cell (approximately 20,000 cells total). Next, bead libraries are added to the cartridge. 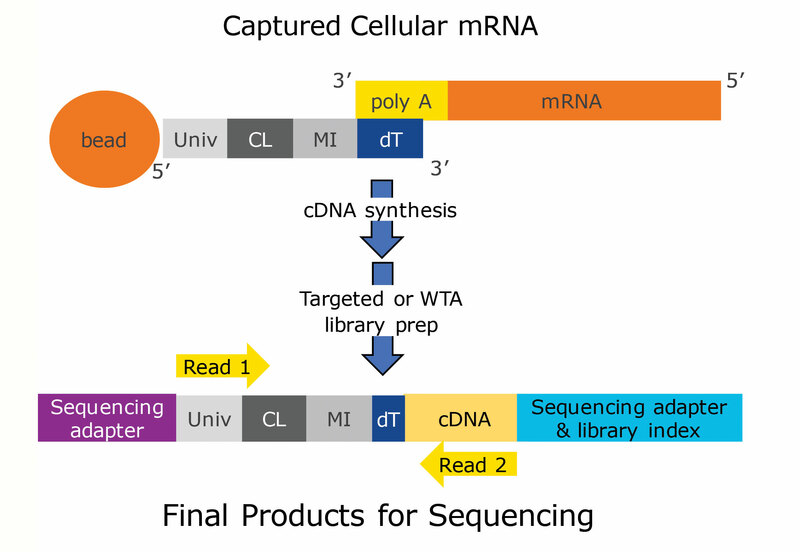 Each bead library contains a universal PCR priming site, a cell label, a UMI, and an mRNA capture sequence of oligo dT (Figure 1). This schema ensures that each cell, and each mRNA molecule within each cell, is tagged with a unique combination of labels. Each cell is then lysed and its mRNA molecules hybridized to the probes on the bead. Beads are magnetically retrieved from the cartridge into a single tube. Reverse transcription and library preparation across all cells from the sample are performed in this single tube. Figure 1. The BD single-cell gene-expression assay captures 3’ poly A mRNA molecules by using functionalized beads. Each bead contains a universal linker, a cell label (CL), a molecular index (MI), and an oligo dT. After cDNA is made through reverse transcription, the cells are pooled into one tube for targeted RNA library preparation. During library preparation, the required sequencing adapters are added. BD single-cell gene-expression assays are designed for targeted RNA sequencing of up to 500 genes at a time. Targeted panels require significantly less reads per cell vs. whole transcriptome sequencing to obtain the required sequencing depth for gene-expression analysis of relevant genes. This robust tool enables the identification and characterization of novel and rare cell types within highly heterogeneous populations at a fraction of the cost of whole transcriptome sequencing. Both custom and predefined gene-expression panels are available through the solution. The benefits of the aforementioned assay design include the ability to sub-sample from the cDNA/bead library, and the ability to archive the cDNA on the magnetic beads for at least three months (per ongoing stability studies). With sub-sampling, a small portion of the cDNA/bead library can be amplified and sequenced shallowly to determine sample quality before dedicating a full sequencing run. The ability to archive cDNA/bead libraries allows users to revisit archived materials (for instance, after an initial round of analysis) for amplification with additional genes of interest. Figure 2. The plots are t-Stochastic Neighbor Embedding (t-SNE) projections of 24,952 single cells derived from disassociated primary and metastatic breast tumors, annotated by originating sample (A) or cell type (B). The data in Figure 2 show the tumor heterogeneity uncovered with the BD single-cell gene-expression targeted assay.3 In this study, cell suspensions of dissociated primary tumor and lymph node metastasis from four patients were first stained with propidium iodide and then sorted with the BD FACSAria™ II to enrich for live cells. Next, targeted RNA libraries for each cell suspension were generated using the BD single-cell Onco-BC panel. This validated, predesigned panel contains ~400 genes associated with breast cancer tumor biology. As the plots in Figure 2 show, the BD single-cell Onco-BC panel reveals numerous cell types contained within all samples, of varying proportion. 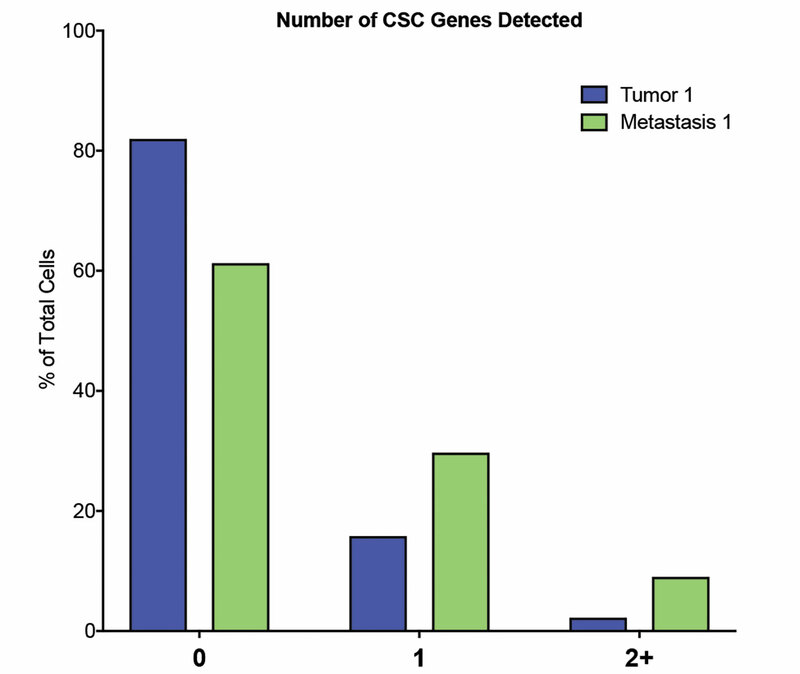 Direct comparison of a set of primary and metastatic breast cancer cells revealed distinct gene-expression patterns in tumor cells, such as a higher proportion of the metastatic cells expressing cancer stem cell (CSC) gene signatures (Figure 3). Figure 3. The graph compares the percentage of cancer stem cells detected in the primary tumor samples vs. metastatic lymph node samples using the BD single-cell Onco-BC panel. Figure 4 compares the required reads per cell between a targeted panel (BD single cell Onco-BC Panel) and whole transcriptome sequencing. 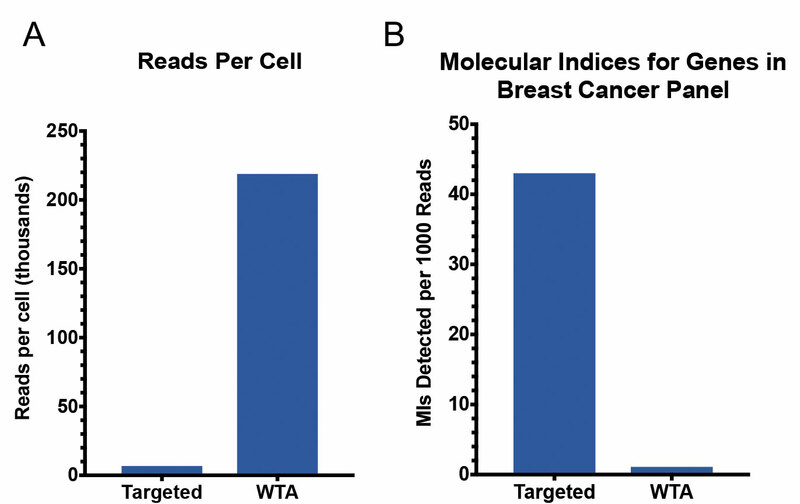 Graph A shows the difference in reads sequenced per cell per assay for a breast cancer tumor sample. Graph B shows the results for the UMI counts for the BD single cell Onco-BC Panel genes expressed in both the targeted assay and whole transcriptome libraries, normalized to sequencing reads. The total sum of molecules associated with the genes in the BD single cell Onco-BC Panel accounts for only 4.6% of molecules observed in the whole transcriptome data. These data show that targeted assay libraries require as little as ~2% of the sequencing reads as whole transcriptome libraries to achieve the same sequencing depth for cell-type identification and analysis of selected genes of interest, presenting an economical alternative to whole transcriptome sequencing. The aforementioned data show the benefits of the BD single-cell analysis system, together with BD TuDoR and BD FACS. This solution provides the complete tools for effective, efficient, and economical single-cell analysis of tumor heterogeneity and for the elucidation of disease mechanism. Disclaimer: BD single-cell gene-expression platform, BD TuDoR, and BDFACSAria are for research use only and not intended for use in diagnostic or therapeutic procedures. Figure 4. The graph in (A) compares sequencing reads per cell required for targeted RNA-seq vs. whole transcriptome RNA-seq (WTA), and (B) compares the number of molecular indices detected per 1,000 reads for targeted RNA-seq vs. whole transcriptome RNA-seq. Kathleen Shelton, is director of market development; Beth Walczak, Ph.D., (ewalczak@Cellular-Research.com) is R&D applications manager, BD Genomics, Menlo Park, CA. 1. H.C. Fan, G.K. Fu, and S.P. Fodor, “Combinatorial labeling of single cells for gene expression cytometry,” Science 347(6222), 1258367 (February 6, 2015). 2. E.M. Walczak, et al., “High resolution of breast heterogeneity enabled with massively parallel single cell transcriptomics,” Poster session presented at the European Society of Human Genetics (May 26–30, 2017). 3. BD Genomics, accessed June 6, 2017.